If you find any broken links, or have questions/comments email me at jackoweskla at yahoo dot com. June 17, 2003 - The character, Hogwarts, and Quidditch pages are completely working, and all of the links are working. All information should be correct, just in time for me to change them for Book 5. If you want to send in a review of Book 5, you can email it to me at the address found under the flying cow. June 8, 2003 - Most of the new character pages are up, but not all of the links are changed over. Expect that in the next couple of days. If any links don't work, please email me. 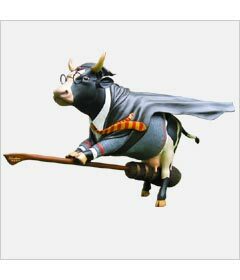 June 7, 2003 - Well, I'm back, and HPFM has a new look, complete with flying cows! I hope the new design, being more simplistic, is easier to get around, and frankly, looks nicer. The site will slowly be going through transitions (might be very slowly... I've got a lot of things going on at the moment) in preparations for Book 5! Speaking of Book 5, in regards to the character dictionary and the Hogwarts pages especially... I will not post anything for two (2) weeks after to give people a chance to read the books, and it may take longer than that to get the dictionary updated, since 860 pages means a lot of new characters. After that, I'll be posting warnings all over the place... and if you don't want spoilers, don't read 'em. I will also take reviews of book 5, at a new email address, so I won't lose them all... the new address is jackoweskla at yahoo dot com. Updates for today: Updates and main character page layout updated.